Farming is on the cusp of the biggest change since the agrarian revolution. What’s driving this change? In a word: technology. Technology deployment in the Agri space grows daily, as the coming together of savvy tech entrepreneurs and farmerpreneurs revolutionises farming as we know it. And, as a joint venture between Russell Smith Farms and Hill Commercial Investments, we do know it, particularly in relation to its place in Cambridge. This is why we chose to sponsor the inaugural Cambridgeshire Independent Science & Technology AgriTech Company of the Year Award. Aware of the hundreds of AgriTech companies making the most of the world-leading science and technology development cluster in the London to Cambridge corridor though, we were not envious of the judging panel’s shortlisting task. Needless to say, when Cambridge Independent revealed the finalists this week, we were delighted to see some familiar names. From Antarctica to Zimbabwe, one billion people rely on livestock for their livelihood around the world. When, in 2015, Richard Hobson travelled from Dublin to Eagle Labs in Cambridge to access funds for his AgriTech start-up, he had all of these farmers in mind. Richard’s intention was to develop an initial prototype for an affordable ‘Fitbit for farm animals.’ Worn as a collar, his cloud-based tagging and tracking mechanism would monitor the key performance indicators of all livestock, whatever their species, wherever they were in the world. What’s more they would provide alerts and updates on key data such as lameness and weight gain, even informing the farmer if a dog was chasing his sheep (or a lion was chasing his buffalo). Richard was successful. 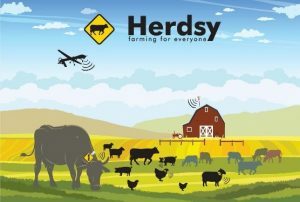 From cashmere goats in China to wild stock conservation of rhino and buffalo in South Africa, farmers are now tracking, monitoring and analysing their livestock’s location and health using Herdsy’s innovative collar. KisanHub is a comprehensive, easy to use online dashboard for farmers. Comprising: a sophisticated crop recording tool; a soil/water balance tool; a hyper-local weather forecasting tool and a news, commodity and market data feed, it looks set to become indispensable for profitable precision farming. Why? Because it will improve decision making for farmers, enabling them to grow more for less. Furthermore, as well as the financial impact this will bring to the agricultural community, it also delivers numerous positive environmental impacts, including reducing the significant amount of water wastage caused by global agriculture (an incredible 70 per cent of all the world’s water is used in global agriculture, of that, around 50 per cent is wasted). 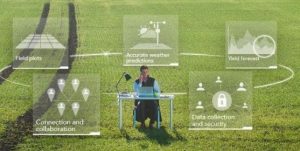 Co-founded by Rothamsted Research, University of Reading, NIAB and SRUC, Cambridge-based Agrimetrics has developed a ‘data platform’ that provides the whole AgriFood industry with a unique opportunity to analyse, compare and combine data – and the UK with an opportunity to lead the development of global food solutions. 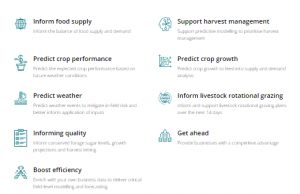 Its mission is to provide, connect and analyse complex data to drive greater productivity for AgriFood businesses and deliver food sustainability. Aiming to help solve the global challenges of economically, ethically and environmentally sustainable food production through the use of data, analytics and artificial intelligence is something SmithsonHill applauds. We’re not the only ones. Both director of AgriTech East, Dr Belinda Clarke, and Dr Chris Winter, managing partner of Brightstar Innovations and partner of New Venture Partners, joined Agrimetrics’ board at the end of 2017. With such expertise within and behind it, we truly believe that this big data solution holds the key to enabling the meaningful interpretation of the limitless amount of data and metrics surrounding the way we produce, supply and consume food. 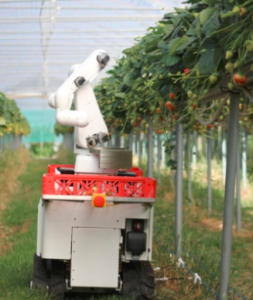 Robotics is, perhaps, the most widely reported upon innovation in AgriTech, and there are several key players emerging along the London to Cambridge corridor. One of the front runners is Melbourn-based Dogtooth. Not only has this organisation created an autonomous strawberry-picking robot that uses machine learning and computer vision, it has built it, proven its place and will be sending a fleet of 24 into the field next year. Founded by Dr Duncan Robertson, Ed Herbert and Mat Cook, Dogtooth has been funded to date by Innovate UK awards and several angel investors, including Peter Cowley (Chair of Cambridge Angels), the Martlet Fund and Angel CoFund. To all the finalists – well done! At the Awards Ceremony on 1st November 2018, Dogtooth Technologies were crowned AgriTech Company of the Year 2018! Congratulations to Ducan, Ed, Mat and the team!